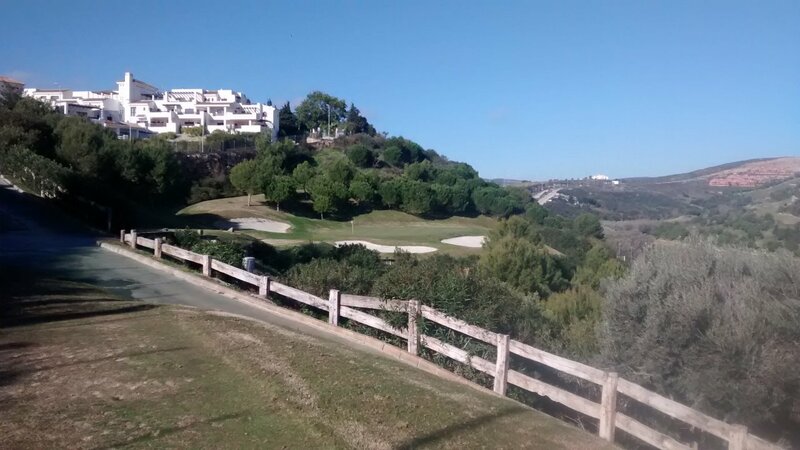 Located a few kilometers West of Estepona, this club is situated in an area that was hit hard by the property bust in 2008. The course is surrounded by hundreds of apartments, of which few are occupied. It is quite likely that large parts of this development are locked down in a financial mess. In this situation, they could well have closed the golf course as well. Thankfully they did not, because this is a really nice middle-of-the road golf course. The clubhouse is quite small but perfectly adequate – probably a compromise one rather than the grander one they would have built if the whole development had been a success. Membership is a few hundred, evenly split between Spanish and other European. Talking to members I get the feeling this club is active - people genuinely trying to make it a fun and busy place despite not having lots of members. All staff I dealt with were friendly and very helpful. The costs here are very reasonable – definitely one of the cheaper courses around for visiting golfers. Doña Julia is quite a scattered course, with very few holes having an adjoining fairway. The first 7 holes wend their way up the valley, then a very long downhill par 5 (575 meters off the yellow tees) heads back towards the coast. After that, the landscape is moderately flat. All fairways are medium width and most have some gentle slope (left/right across the fairway) on them. There are no hole maps out on the course, but the line to play off the tee on each hole is fairly obvious. You can easily see the entire hole layout in front of you off the tee on all but a few holes. Mostly the line to play on the longer holes is the 'high-edge' of the fairway. Often there are fairway bunkers trying to trap your ball if you take too direct a line. Just looking at those confirms to you immediately what line you should be taking (if you have not already figured it out from the obvious slope of the hole). The greens are large and receptive. A few are tiered. There is usually plenty of green to aim for if you want to avoid an obvious trap like a green-side bunker. Sure you may end up 5 meters or more from the pin, but the greens are medium-paced and very consistent. Getting down in 2 putts is a fair challenge but not a hard one. The bunkers everywhere are not really set down in the landscape and have good quality sand – medium-grained but plays well i.e. a decent bunker shot under the ball will get a suitable reward. So overall the bunkers are moderately easy, not a notably difficult feature of the course. There are a few lakes out there, but those are only in play on 2 or 3 holes and even then not particularly hard to avoid. There is little true rough, just some quite steep slopes adjacent to a few holes that your ball can easily roll out of back onto the fairway. Buggy paths are built to very high standard. In a club/course in this situation, there have to be some compromises. They simply do not have the money to maintain absolutely everything 100%. So where are these compromises ? The major compromise to me is the quality of some of the grass. Away from the holes (e.g. between one green and the next tee box) the grass can be very varied with bald patches. Fair enough – they do not maintain those particular areas carefully. That does not worry me – these are areas of the course that only a really wildly hit golf ball is going to visit. The fairways do have some mixed grass, but overall play well. The key thing to me is I see nowhere the type of really nasty invasive spiky grass that wrecks golf courses. So they have definitely not 'lost' the grass here, even though some of the remoter parts look a bit scruffy. Ditto for the tee-boxes. The grass there is OK, but certainly not high quality. Again, I do not really mind. The second area of compromise is that fairways have an unusual number of unrepaired divots. The buggy we got had no sand on-board, and there seems to be no effort by staff to routinely repair divots. A minor pity this – it makes perfectly playable fairways appear a little bit less decent than they actually are. The third area of compromise to me is similar, but on the greens. These seem to have an unusual number of pitch-mark scars. So greens have a bit of a freckled appearance. Again, this does not affect your putting – it just makes otherwise perfectly acceptable greens look a bit odd. I must emphasise these concerns are very minor indeed. Just little things that stop this being described as a 'fine' golf course. Everything else about Doña Julia I like. It is a really nice course for 10-20 handicap players. Enough variety on every hole to reward shots played on a good line and length. Not long enough for length to be a real challenge. In other words the sort of course where mid-handicap players should feel that reaching a green in regulation is definitely achievable. And then nice big greens are quite forgiving. So not a difficult course by any means. Low-handicap players should find this course quite easy. High-handicap players (30+ handicap) might struggle a bit here because it is not very flat, but could not reasonably describe the course as tricky. Actually the thing I like most about this course is its consistency. All holes have similar style and play pretty much the same way. The fairways are consistent medium-good standard, as are the greens. There is no run of easy holes followed by a really nasty hole that jumps up and bites you. This is the sort of course to play sensible relaxed golf (within your ability, not trying too hard). For golfers at my level of 15 handicap, definitely a course I feel I can score well on. So a real pleasure. 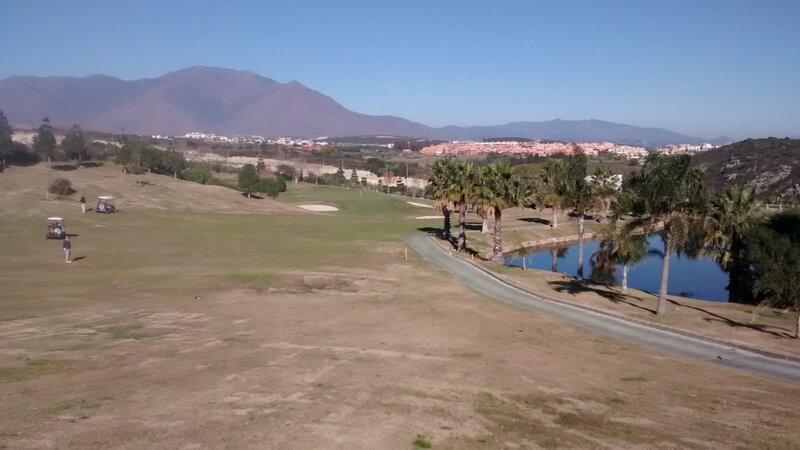 And given the typical low cost, I think this is one of the best value-for-money golf courses on the entire Costa del Sol. Recommended. Well worth a trip even if your starting point is not close by. I really hope they keep this course going and continue to survive the property desolation all around them. Review last updated: November 2014. Number of times played: 7. The yellow dot is Doña Julia. 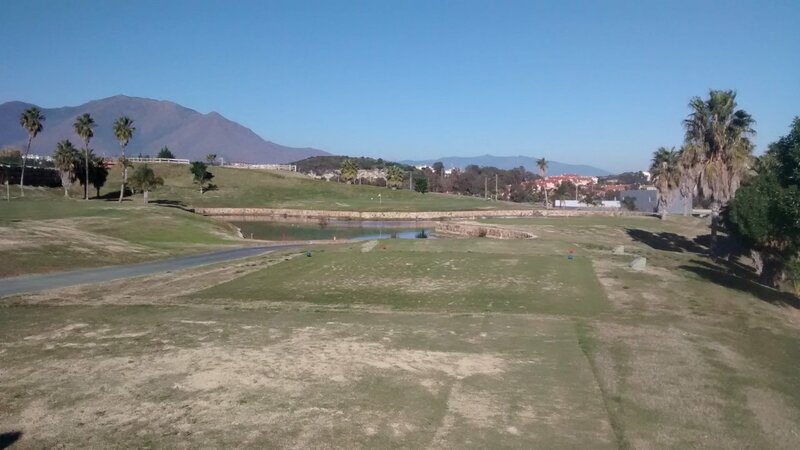 This course is almost exactly average length and difficulty compared to all other golf courses on the Costa del Sol. An 18-handicap player can expect to go around this course in 20 over par.